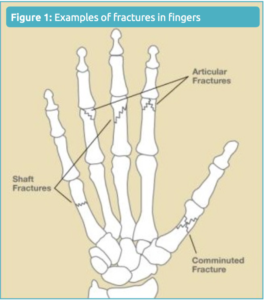 • Open (compound) fracture, when a bone fragment breaks through the skin. This causes risk of infection. A splint or cast may be used to treat a stable fracture some unstable fractures, in which the bone has moved, may need to be set and then held in place with wires or pins. This is done without surgery. More serious fractures may need surgery to set the bone and hold the bone fragments together with pins, plates or screws. a bone graft may be necessary. In this procedure, bone is taken from another part of the body. To increase your chances of a healthy recovery, do not smoke, and carefully follow your doctor’s instructions. Your doctor may recommend hand therapy to improve the process. It is important to note that not all fractures completely heal. Because bones have such a close relationship with ligaments and tendons, the hand may be stiff and weak even after the healing process. Some fractures may lead to arthritis down the road. In addition, fractures in children occasionally a ect future growth of that bone.